[SatNews] Orbital Sciences Corporation (NYSE: ORB) has received two separate orders from NASA to launch scientific satellites on its industry-leading small rockets, Pegasus(r) XL and Taurus(r) XL. These contracts bring the total Pegasus and Taurus orders to 55 vehicles since the first Pegasus was purchased in 1988. 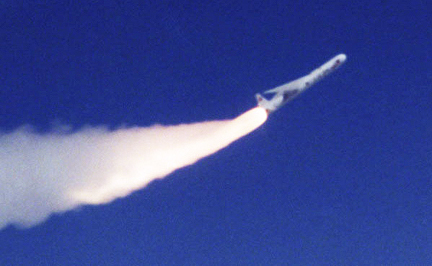 Orbital Science's Pegasus XL rocket in flight. Taken together, the two rockets have launched, or will boost, a total of 35 NASA scientific and technology demonstration spacecraft on 30 missions since 1990. Orbital is scheduled to launch the Interface Region Imaging Spectrograph (IRIS) spacecraft in December 2012 aboard a Pegasus XL rocket from Vandenberg Air Force Base in California. IRIS is a NASA Small Explorer (SMEX) mission to measure the Sun’s flow of energy through the dynamic region in the solar corona and heliosphere to help scientists better understand the effects of solar energy release processes on Earth. The planned 2012 launch will be the rocket’s 45th mission since its initial flight in 1990 and the second Pegasus launch scheduled for that year, following the launch of the Orbital-built NuSTAR scientific satellite in February 2012. Orbital Science's Taurus XL rocket on launch pad. In a separate contract, NASA tapped the company’s Taurus XL launch vehicle to boost the Orbital-built OCO-2 environmental monitoring satellite into orbit. OCO-2 will provide critical space-based data on carbon dioxide in the Earth’s atmosphere. A Taurus XL rocket, also launched from Vandenberg, will deliver the OCO-2 satellite into a 705 km sun-synchronous polar orbit where it will join NASA’s “A Train” constellation of Earth monitoring scientific satellites. 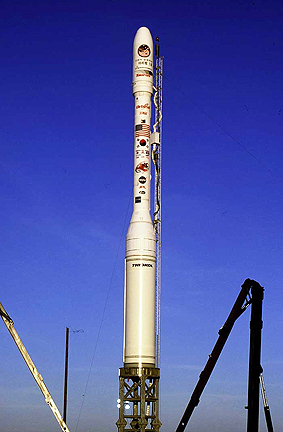 The launch, currently scheduled for early 2013, will represent the 10th flight of a Taurus rocket since its first launch in 1994. The next scheduled Taurus launch will boost the Orbital-built Glory satellite into low-Earth orbit for NASA in the fourth quarter of 2010.